At 15 miles long, it is smaller than its more famous neighbours but just as perfectly-formed! Nestling amid the scenic mountains at the gorgeous northern end of the lake is the resort of Lovere. There is a full day out on the lake to visit the appropriately named Monte Isola, ‘Mountain Island’ – Italy’s lake-island, which rises a full 420m above Iseo’s shimmering waters. On another full day excursion, you can enjoy the alpine scenery of the Camonica valley from your train window, visiting the pretty towns of Edolo and Pisogne which is home to famous prehistoric rock carvings. Day One: Flight to Bergamo or Malpensa Airports. Transfer to your resort of Lovere (40 minutes from Bergamo, 90 minutes from Malpensa). 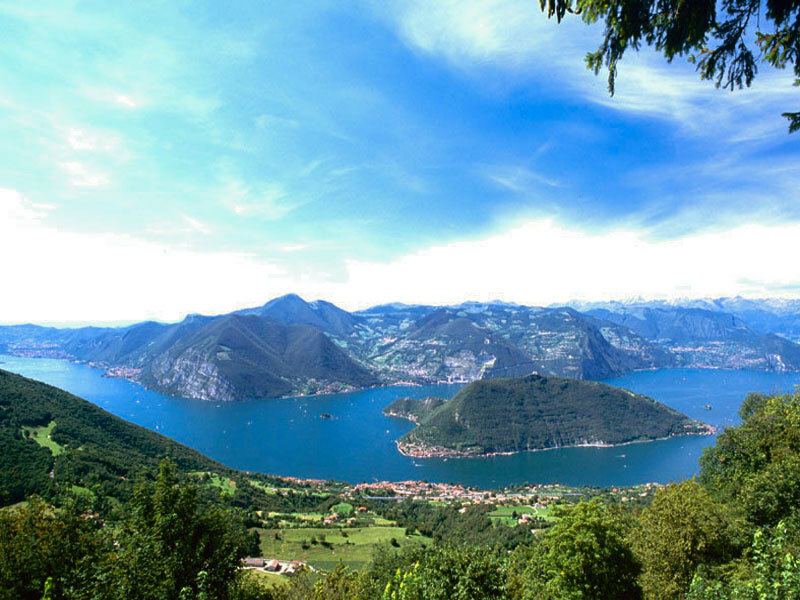 Lovere: Set on a bay of Lake Iseo, with a semi-circle of mountains behind, the setting is wonderful. A member of ‘I Borghi Piu Belli d’Italia’, ‘Italy’s Most Beautiful Villages’, this pretty little town of 5000 people has Italian-style arcaded streets, but with Swiss-style wooden overhanging roofs. Along the lakeside are grand old palaces, a modern yachting marina and a good selection of shops, bars and restaurants. Climbing up into the old town, you are soon in an old-fashioned Italy of shady squares and ancient church towers. There is good public transport for getting around on local buses and a boat service which links Lovere with Pisogne (15 minutes trip), which has a railway station on the line between Brescia and Edolo. Days Two to Seven: At leisure in resort with two included excursions. The first is a full day cruise on the lake. In the morning you sail south calling at the little lakeside villages, right down to Iseo town at the southern end where there is free time for lunch. Retracing its wake, the boat calls in at Monte Isola where you have a little time to explore. Monte Isola is also in the list of Italy’s Most Beautiful Villages, but there are in fact 2000 inhabitants in the islands several villages and hamlets. The ‘island mountain’ reaches 420m above the lake (600m above sea level), with a fortress on top. You then cruise back to Lovere. The second included excursion takes you on a full day tour of the beautiful Camonica valley, by train, coach and boat! You depart by coach to the Naquane Archaeological Park, 20 miles away. Please note there is a walk on cobbles mainly uphill from the bus parking place to the entrance of the Park. Your guide will show the highlights of the pre-historic rock art of animals and people dating from the stone age through to the Roman period before you continue to Edolo. Edolo, the ‘Granite Village’ at the top of the valley, is set amid mountains reaching 3300m. You have time to stroll the medieval town centre and have lunch here before taking the train back down the valley to Pisogne. In Pisogne you visit the medieval tower in the main square and the church of Santa Maria della Neve. Referred to as the ‘poor man’s Sistine Chapel’, the church has wonderful frescoes painted by Romanino between 1532 and 1534. You also have free time in Pisogne before taking the 15 minute ferry trip back to Lovere. Optional excursions, including a scenic trip to St Moritz aboard the Bernina Express Train and a coach trip to Bergamo’s magnificent Citta Alta and the mountain village of Clusone in the Valle Seriana, will also be available. Day Eight: Free time until your departure to the airport. Depending on flight times, there may be time for a spot of last-minute shopping en route. Day Eight: Free time until your departure to the airport. Depending on flight times, there may be time for a spot of last-minute shopping en route.